I stepped off the plane in St. Thomas on March 4th squinting and instantly sweltering in my long pants and boots. 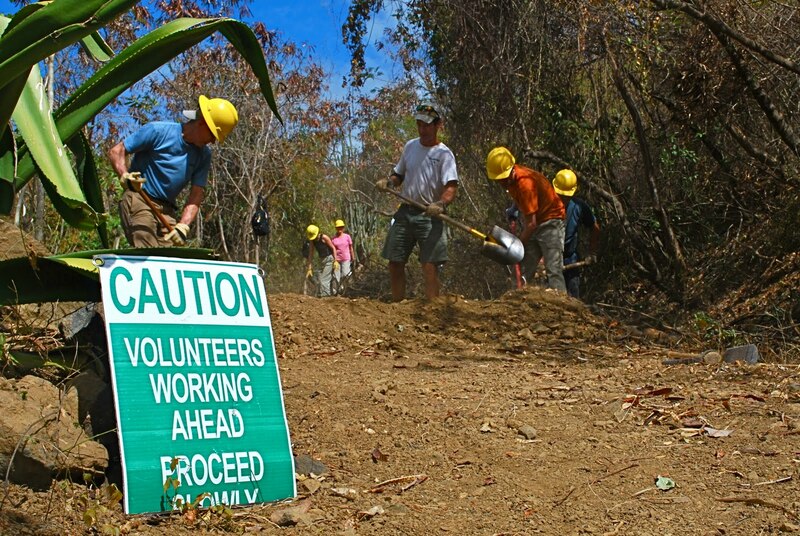 I’ve now been back from leading two weeks of volunteer trail crews in the Virgin Islands for over a week. Although the mountains of snow piled around Pinkham seemed almost surreal at first, I’m so conditioned to the intensity of North Country weather that it took me less time to get reacquainted with them than it did for me to initially adjust to that stranger, the sun. Somewhere under these layers and wool hat I still have the remnants of a minor farmer’s tan to remind me that our work with the Friends of the Virgin Islands was not, in fact, a happy dream. In 2010, The AMC’s Trail Volunt eer Vacations renewed it’s partnership with the Friends of the Virgin Islands after a 20 year hiatus of the volunteer trail program in the USVI National Park. 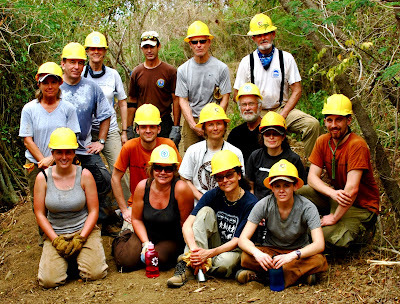 Expanding to two 1-week crews this year, we had a total of 24 enthusiastic, dedicated, and hard-working volunteers. I credit crews like these with how much I enjoy my job. Our work site exuded a tough and professional vibe, colored with notes of the camaraderie and teamwork that we eased into in camp. From March 7th to the 18th, we worked our way up the hill as one unit like a centipede, leaving a more accessible and sustainable trail in our wake. By the end of the first week, led by Megan and Matt, we were 2 days ahead of where Friends Volunteer Coordinator Jeff Chabot expected us to be. Week 2, led by Megan and Goose, filled the big shoes that were left for them by picking right up where Week 1 left off and maintaining that momentum. In total, our crews constructed 14 water drainage features, standardized and out-sloped about 350 yards of tread way surface, and standardized the length of that corridor on the Johnny Horn Trail. Trail work in the tropics certainly challenged us to think in new ways. For e xample, in widening the trail corridor we kept a trained eye out for invasive tan-tan trees. The dry, compacted soil of this trail had seen almost no rain in 3 months; later in the year it will experience one deluge after another during squall season. The erosion this weather is capable of causing would not only be potentially detrimental to the surrounding vegetation and longevity of the trail, but to marine life as well; runoff material from Johnny Horn is deposited directly into Waterlemon Bay, a turtle nesting site, where it covers and suffocates coral reef. In the Northeast we expect to encounter black flies, moose, and red squirrels on the trail; in St. John, we were a little out of our element running into roaming goat herds, wild donkeys, anoli lizards (think gecko), and…tarantulas! With every strike of the pick-mattock, we broke open the sandy, rocky soil mixture where the spiders make their homes and keep their e gg sacks. The surprisingly nonthreatening creatures would emerge at our feet often, most no bigger than a silver dollar, a few as big as the palm of a hand. The only one that was decidedly not cute and fuzzy was the one that managed to crawl up to my shoulder before I noticed it. We departed camp for the trail by 8 every morning, and Jeff would work the crew as long as we could be reasonably productive in the heat, humidity, and relentless sun (about noon). After loading the tool cache and lunching in the sparse shade on the site of some colonial ruins, Jeff would often show us something exciting the small island had to offer, or we would explore on our own for the latter part of the afternoon. We kept busy with tours of centuries-old, dilapidated sugar cane mills; snorkeling excursions that offered underwater forests with fish slowly flying through them (and the occasional roaming turtle or stingray); shady hikes that ended at some quiet beach; and numerous other secret and celebrated St. John adventures. 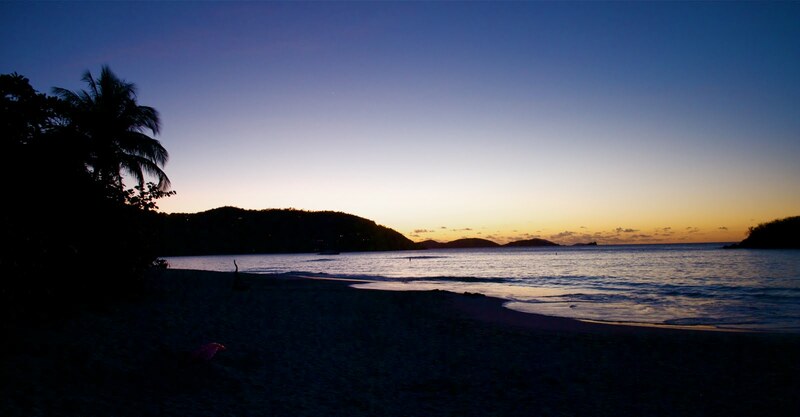 It goes without saying that the geography, trails, history, and shores of St. John were undoubtedly worth adjusting to the 90 degree difference in temperature each way. What makes this trip unforgettable, however, is the company we shared it with. We truly ap preciate the boundless energy and enthusiasm of our volunteers both on the trail and in camp, and the joy and pride they took in their work is inspiring. A special thanks to Jeff Chabot for his dedication to the trails and trail volunteers; our experience on the island was seamless and enjoyable thanks to his time and guidance. We hope to be back next year.